..... The vertical fin is cut out of the remains of the piece that you used to make the canard. center section core. (Remember, the one we told you to keep and not throwaway). The sketch is self-explanatory. ..... These two cores are made from the piece marked 'save' that was left over after hot-wiring the main wing, BL50-100 cores. The stagger shown on the front view is necessary because the rudder core is 27" long, while the remaining trailing edge length is only about 13". 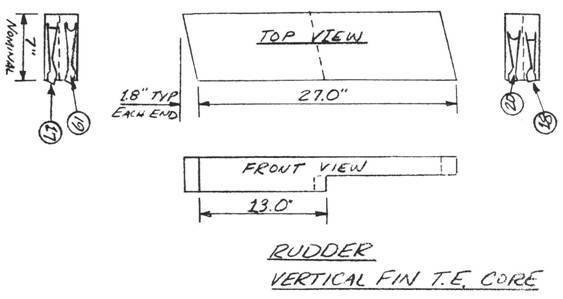 It is suggested that you cut the rudder core first, and then reduce the block length to 13" for the trailing edge core. As a note of explanation, the rudder extends up the vertical fin only part way. (Similar to the way that the aileron extends outboard on the main wing only part way). ..... The wheel pant cores are cut out from the scrap pieces that you now have laying around. They needn't be hot-wired, except to obtain the proper thickness, but rather can be cut out by bandsaw or coping saw. ..... The remaining scrap can be used for many miscellaneous purposes, such'as supporting major components to avoid damage, soft sanding blocks, filets to clean up airflow, etc. use your imagination.